OG-Hi5-4K-Plus is an openGear card that offers 3G-SDI to HDMI 2.0 conversion for 4K/UltraHD/2K/HD/SD sources, supporting up to 60p from professional 4K/UltraHD devices when monitoring to HDMI 2.0 displays. 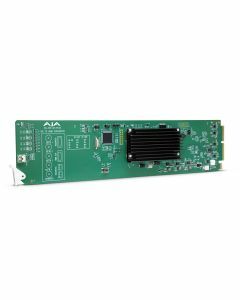 Designed for use in high density openGear 2RU frames including AJA’s OG-X-FR 2RU frame, new DashBoard Software support on Windows®, macOS® and Linux® offers remote control and monitoring of the openGear architecture and provides convenient and industry standard configuration, monitoring and control options over a PC or local network. HDR or High Dynamic Range, provides the ability to display a wider and richer range of colours, much brighter whites, and much deeper, darker blacks than standard signals allow. This gives your imagery a more ‘dynamic’ look and allows for natural true to life colors to be communicated to your audience. OG-Hi5-4K Plus provides this support for your 4K/UltraHD/HD HDR pipelines to HDMI compatible displays by generating HDR metadata in accordance with HDMI v2.0a/CTA-861.3. OG-Hi5-4K-Plus also provides support for Hybrid Log-Gamma (HLG) HDR displays over HDMI.